Flood waters blocked an ambulance bringing Lawrence Collier, a member of the Sang Run CCC Camp in Garrett County, to Memorial Hospital late yesterday afternoon. Collier, suffering from pneumonia, was in a critical condition at camp and was ordered to the hospital here. 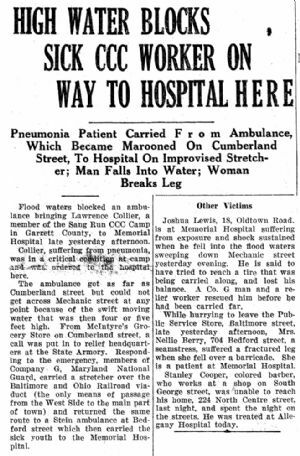 The ambulance got as far as Cumberland street but could not get across Mechanic street at any point because of the swift moving water that was then four or five feet high. From Mclntyre's Grocery Store on Cumberland street, a call was put in to relief headquarters at the State Armory. Responding to the emergency, members of Company G, Maryland National Guard, carried a stretcher over the Baltimore and Ohio Railroad viaduct (the only means of passage from the West Side to the main part of town) and returned the same route to a Stein ambulance at Bedford street which then carried the sick youth to the Memorial Hospital. Joshua Lewis, 18, Oldtown Road, is at Memorial Hospital suffering from exposure and shock sustained when he fell into the flood waters sweeping down Mechanic street yesterday evening. He is said to have tried to reach a tire that was being carried along, and lost his balance. A Co. G man and a relief worker rescued him before he had been carried far. While hurrying to leave the Public Service Store, Baltimore street, late yesterday afternoon, Mrs. Nellie Berry, 704 Bedford street, a seamstress, suffered a fractured leg when she fell over a barricade. She is a patient at Memorial Hospital. Stanley Cooper, colored barber, who works at a shop on South George street, was unable to reach his home, 224 North Centre street, last night, and spent the night on the streets. He was treated at Allegany Hospital today.